Travel Costs > How Much Does Boston Logan Airport Parking Cost? How Much Does Boston Logan Airport Parking Cost? Boston Logan Airport, administered by the Massachusetts Port Authority, is the departure and arrival point for over 100 domestic and international flights. 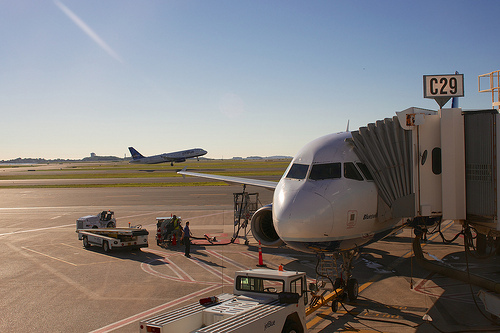 Located at the Boston Harbor by Interstate 90, the international airport has more than 40 airlines operating. How much does parking at Boston Logan Airport cost? According to the Massachusetts Port Authority website, Boston Logan International Airport has different options to choose from. Logan International Airport provides various parking options offered at hourly and daily rates. Central Parking Garage provides easy access to all terminals. Terminal B Garage has easy access to Terminal B, while Terminal E Parking lots give easy access to Terminal E. Economy Parking is the most affordable long-term parking option. The airport has 26 charging ports for electric vehicles and 173 parking spots designated for a hybrid, alternatively fueled and electric vehicles. When you park your car, you will be given a ticket that will need to be placed on your dashboard in clear view. When you exit, this ticket will tell the parking lot attendant when you parked your car there so that he knows how much to charge you. Many parking lots offer some sort of security. This could be as basic as a gate to prevent unwanted people from getting in and out, a camera system that can be reviewed in case anything happens to your vehicle, or possibly even a security guard making rounds every so often to make sure there is no suspicious behavior. Most airport parking establishments are open 24 hours a day, all days of the week and are usually equipped with automated entrance and exit gates. Some parking lots will have an option for you to pay at a machine with your credit card, while others will have an attendant there to take your money. Depending on the airport parking company, the service may include a free shuttle to and from all terminals and free luggage assistance. Logan Airport also provides a program called Parking Passport Gold that guarantees parking spaces even when the sign says otherwise. Joining this program that ensures a parking space every time costs $200 the first year and $100 for the succeeding years. The hourly rates for guaranteed parking are higher after the first 4 hours. If you enroll in Logan’s Parking Passport program, you will be required to pay the enrollment fee of $5. Those who lose their parking ticket will be charged with the applicable parking fee plus $5. If you take the free shuttle service, some drivers expect a tip when you get off. This is usually only $1 or $2 but is still an extra cost to consider for the way there and the way back. If you prefer to pull right up to the terminal and have other people park your car using a valet service, this will make your costs much higher. Always bring your parking ticket with you and avoid leaving it in your vehicle. Some private parking companies charge on a fixed basis and base the cost on arrival and departure time as well as how long the parking spot will be used. The Massachusetts Port Authority advises individuals using the parking facilities to pay for parking at an Exit Express Parking Pay Station located in the terminals or garage lobby areas. If you will only be at the airport for a short period, park at the economy garage, where the rates usually start after the first hour. Use the shuttle service to go to the required terminal. Using the economy parking option can save from $1 to $6 a day. The obvious way to save money on airport parking is to ask a friend or family member to drop you off and pick you up from the airport. Local parking garages often participate on Groupon. Check out this daily deal website to see if there are any current savings.